At the NFL scouting combine in February, wildly popular Heisman Trophy-winning quarterback Johnny Manziel officially measured in at 71¾ inches and 207 pounds. His diminutive stature was such a hot topic prior to the 2014 NFL draft that the media couldn’t resist the puns: “Johnny Manziel Comes Up Short At NFL Combine “(CBS Cleveland); “The Long and Short of Johnny Manziel” (ESPN Cleveland); “Will Johnny Manziel Measure Up for the Browns?” (CantonRep.com). Ultimately, the Cleveland Browns selected Manziel with the 22nd pick in the first round. With several QB-starved teams near the top of the draft (including the Browns, who passed up two earlier chances to draft Manziel, first by trading out of the fourth pick and then by selecting Justin Gilbert with the eighth), most expected him to go higher. We don’t know why Manziel went where he did, but we do know that he is undersized for his position. And historically NFL teams’ approach to undersized QBs has been not to draft them — if they’re short. My research suggests this strategy is insufficiently nuanced: If height matters at all, NFL teams have already accounted for that and then some. Being too light-weight, on the other hand, appears to be a stronger predictor of performance (or lack thereof), and NFL teams seem not to have accounted for it enough. For a QB of Manziel’s height, being drafted even late in the first round is incredibly rare. 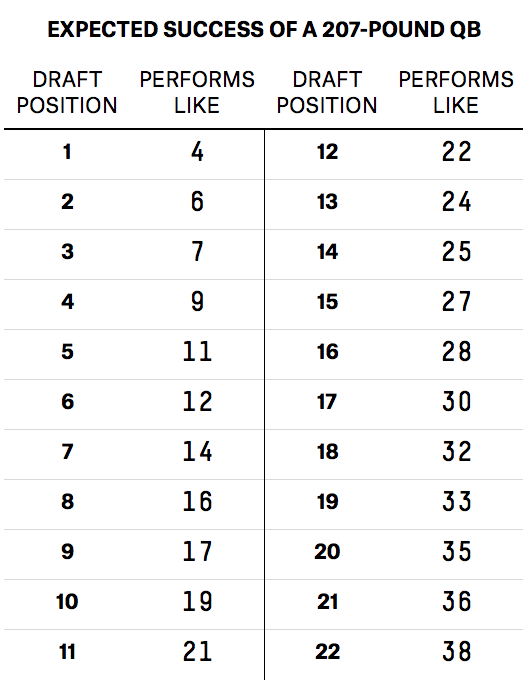 From the 1967 merger through 2013, NFL teams selected 209 quarterbacks in the first three rounds of the draft, yet just five of them were 72 inches (6 feet) or shorter. Of those five, only Michael Vick (listed as 6 feet) was selected in the first round. For comparison: Since 1987, NBA teams have drafted five players 6 feet or shorter in just the first 10 picks of the first round. If we looked at those five quarterbacks alone, drafting short QBs would look like a pretty good bet. They have a combined career Approximate Value (AV)1 of 260 — greater than the combined AV (210) of all 12 QBs listed as 78 inches (6 feet 6 inches) and taller. This comparison is for amusement purposes only: It’s a tiny sample, and both of these groups include a number of active players with a lot of productive years ahead of them. But it hints at bigger issues with how the NFL accounts for height. Many media pre-draft scouting reports don’t distinguish between height and weight, frequently referring to a player’s “size” or “bulk” instead. But when it comes to size metrics, the NFL appears to be much more forgiving of light quarterbacks than short ones. 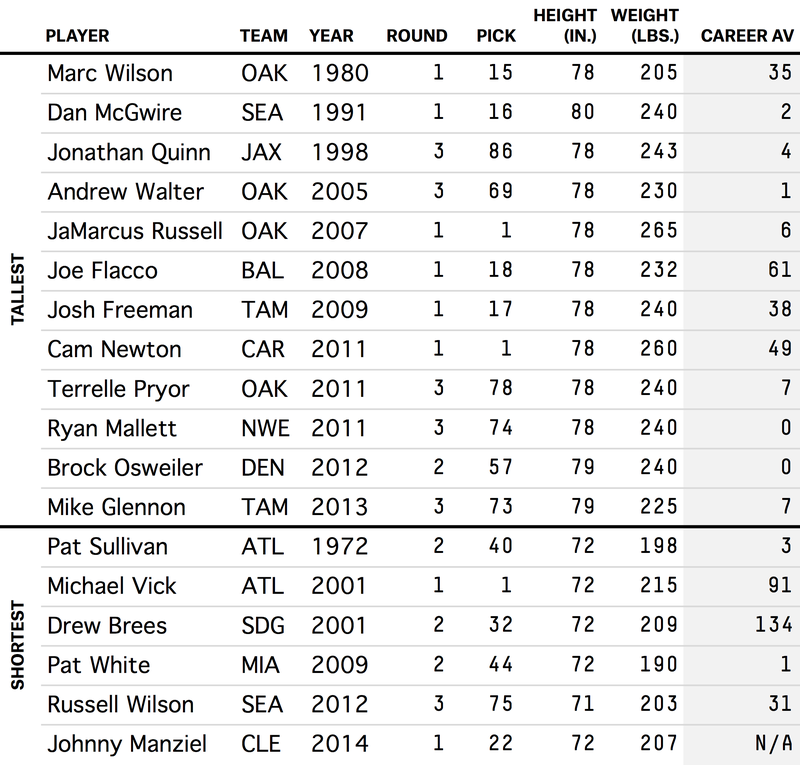 The average weight for a 71- to 72-inch quarterback is 202 pounds, yet 27 quarterbacks this weight or below have been drafted in the first three rounds over the same time period (1967-2013), which saw only five QBs of that height taken. To examine whether this particular reluctance to draft short QBs (while being willing to draft light ones) makes any sense, I classified the broader pool of drafted quarterbacks (limiting to those selected in the top seven rounds) based on how they compared to Manziel’s weight and height. From there I compared each group’s average AV per season to see whether any of the groups performed better than the others. Looking at the right column, we see that short QBs have done slightly better on average than non-short QBs (3.0 average AV per season versus 2.4). But even with seven rounds of draft picks this number is still pretty small: Just 29 short QBs are included in this comparison (so the results are not statistically significant). But the weight columns show a stark divide between quarterbacks on either side of Manziel (2.7 average AV per season versus 1.6 overall). There’s a broader sample, too: 107 players weighed in at 207 pounds or less, compared to 311 who were heavier. Based on that, it seems that drafting a quarterback of Manziel’s weight is a more dangerous proposition than drafting one of his height. But that’s a pretty crude binary analysis. Because the NFL draft market is fairly efficient, if there were a relationship between height or weight and career potential, we’d probably expect it to be priced into each quarterback’s draft position (or whether a quarterback gets drafted at all). 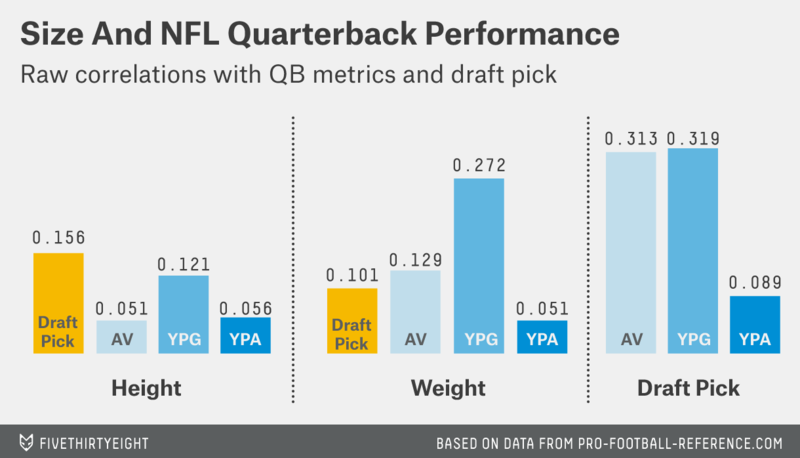 That grouping of bars on the left shows us that height is at least a little correlated to Approximate Value, yards per game and yards per attempt — but it correlates much better with the QB’s draft position. Weight, on the other hand, correlates to our QB metrics much more, and, importantly, it correlates with draft position less. In other words, height appears to tell us less than weight does, and what it does tell us we’re more likely to have already known. While correlations alone don’t tell us what’s causing what, so far this is a pretty poor showing for height as a predictor of quarterback performance. But there are still a lot of possibilities, so to get a better sense of which variables are doing what work, I created regression models that use height, weight and draft pick to predict a variety of metrics, and then compared how important each variable was to each model. Not only is height not a good predictor when combined with weight and pick location, it’s a slightly negative one (though to be a statistically significant negative predictor, we’d want to see values below -2.0). This doesn’t mean that height is bad, it just means that — whatever value it may have — NFL teams are likely overvaluing it. Weight, however, is a highly significant predictor for these metrics.6 Since draft location is included as input for this regression, this strongly suggests that NFL teams have not been sufficiently pricing weight into their selections. There are a number of possible reasons for this. My guess would be that it has something to do with the physicality of the NFL game, and that teams may become enamored with a QB’s skill or accuracy and undervalue his strength or durability. But figuring out exactly why weight is so predictive is a whole different investigation, and one which may be too complicated for the amount of data available.7 So instead of diving deeper, let’s simplify. The thing we really care about is whether a QB has a minimally successful career. To test this, I’ve set the “successful career” cutoff at about 32 AV, which sets apart more or less the top 100 drafted QBs since 1967.8 Basically, our “successful” cutoff is going to be all the good QBs you’ve heard of, down to about the likes of Joey Harrington, Rick Mirer, Vince Young, Byron Leftwich or (going further back) Steve Spurrier. While the worst of the “successful” quarterbacks may sound pretty bad to you (Tim Couch, Browns fans? ), nearly two-thirds of quarterbacks selected 22nd overall (Manziel’s draft position) will likely be even worse. We can predict the baseline likelihood of a QB being “successful” or not by using a logistic regression9 with just his draft position.10 I’ve grouped QBs by rounding their weight to the nearest 5 pounds, then calculated how many of that group should have had “successful” careers based on each of their draft positions, and then compared that to the number of them who actually did. Once that was done, I plotted how each group succeeded relative to our expectations. 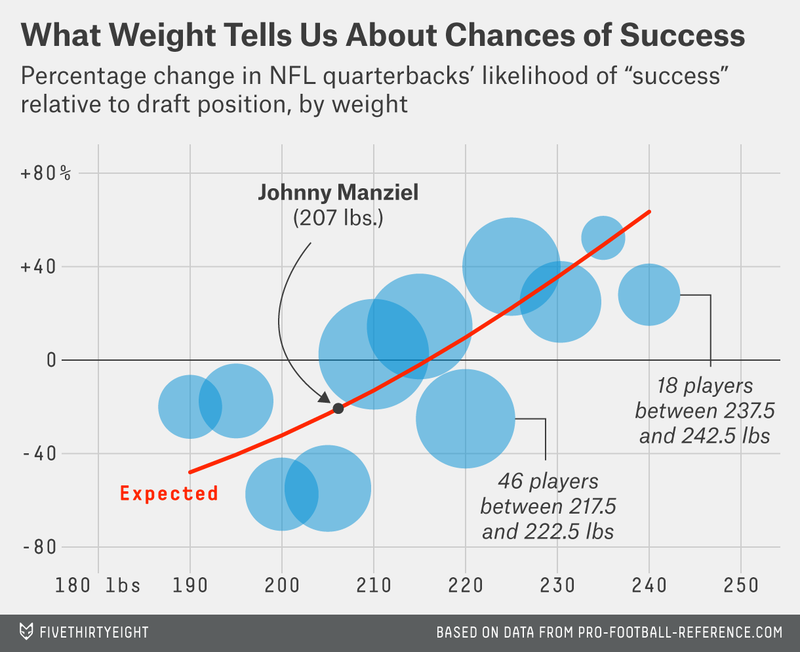 The red line shows how much more or less likely a QB of a given weight is to be successful than we would expect based on his draft position alone.11 Manziel is listed as 207 pounds. From the model, we’d expect about 19 percent fewer 207-pound QBs to be successful than we would expect based on their draft position. The odds of being “successful” for a QB taken 22nd overall are approximately 34 percent. The odds of a 207-pound quarterback selected 22nd overall being successful are around 27 percent (81 percent of 34 percent). In draft-pick terms, that’s about the same as an average-weighted quarterback drafted 38th overall — a substantial but certainly not damning drop. We can make that same kind of calculation for each draft position. On the other hand, Manziel was projected to go higher in the draft. It’s possible that he was unfairly dinged for his height, but not dinged enough for his weight. If the Browns had selected Manziel with the eighth pick, my model’s size-weight adjustment (which is basically a weight adjustment, since height didn’t meet the threshold for inclusion), would make him about as likely to be successful as a No. 16 pick. That would match up pretty well with the Browns’ actual draft day decisions: to pass on Manziel with the eighth pick, but then to trade up to take him with the 22nd. I’m not in love with this metric — or really any QB rating metrics — but it sums well, and for testing league-wide hypotheses, virtually any reasonable metric will do. Technically these correlations use the logarithm of each player’s pick, as do all the regressions in this article. If you’re wondering why I’m not using more complicated efficiency metrics like Passer Rating, ESPN’s QBR, or Brian Burke’s Win Percentage Added, it’s because I think they all correspond much too strongly with the style and quality of a QB’s team and offense — at least for these purposes. If you’re making finely grained comparisons, you may be willing to accept that cost in exchange for those metrics’ higher precision, but for evaluating the long-run impacts of hundreds of QBs, I prefer to use broader measures. Mostly what I want to know is how likely these players were to have long, productive careers. It’s the weight you should put on the variable divided by its average error. This is about the cutoff for “statistical significance,” meaning that the correspondence seen in the data would happen less than 5 percent of the time by chance. This is about the minimum amount of confidence you need in a variable to make using it worth your while. As it is for most metrics to varying degrees, though it does tend to do best on per-game and per-year bases. This is basically the main challenge with every NFL-related problem. Note that it doesn’t really matter exactly where we draw the line so much as that we draw a line at all: Anything will do for a barometer. A regression that predicts binary outcomes like wins/losses, good/bad, etc. In case you’re interested, the Excel formula for this is =1/(1+EXP(-(1.1536-0.40511*[logpick]))), where [logpick] is the logarithm of the QB’s draft position in base 2 (or log([pick],2)). In Excel, this formula is: =((1/(1+EXP(-(-7.814506+0.031653*[weight]))))-0.272723209)/0.272723209.